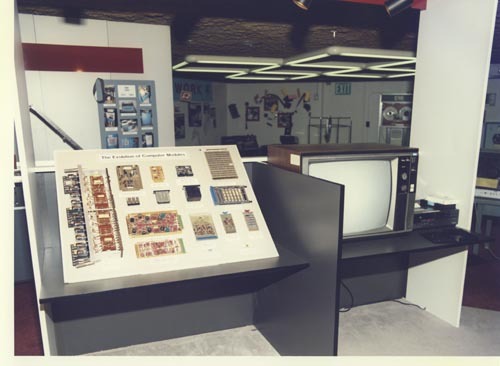 Color image of some Lawrence Livermore National Laboratory's exhibits at the 1984 National Computer Conference. In the foreground are two cubicle exhibits the one on the left is a poster "The Evolution of Computer Modules". It has several modules from tubes to transistor pluggable units. In the cubicle on the right is a television set with a vcr. In the background are several of the NCC exhibits.